Suva players celebrate after Meli Codro (11) scores against Lautoka during their Vodafone Premier League match in Churchill Park, Lautoka on January 27, 2019. Photo: Waisea Nasokia. A 9-man Suva football side beat Lautoka 1-0 in the Vodafone Premier League clash at Churchill Park, Lautoka yesterday. Suva coach Imtiaz Khan said it was like a dream come true since Lautoka are the current VPL champions. “We’re at the 9th or 10th spot last year,” he said. “Looking at the Lautoka team all credit goes to the players, the officials as they gave 300 per cent. “This is what we wanted but it’s not me that brought the change instead we worked together as a team. “We’ve a different formation and we’ve the players and the capability to do it. What happened: Nippy Meli Codro was the toast for the capital city side scoring the lone goal in the 87th minute. But moments later he was given his marching orders for a second bookable offence by referee Avinesh Narayan. He was earlier booked and received a second yellow card for taking off his jersey as he celebrated his goal. However, the visitors were dealt an early blow when solid defender Remueru Tekiate was red-carded in the first half and Suva had to reshuffle their backline. Lautoka failed to break a 10-man Suva side for most of the game and when they were a goal down at the death the Blues desperately went out looking for an equaliser. 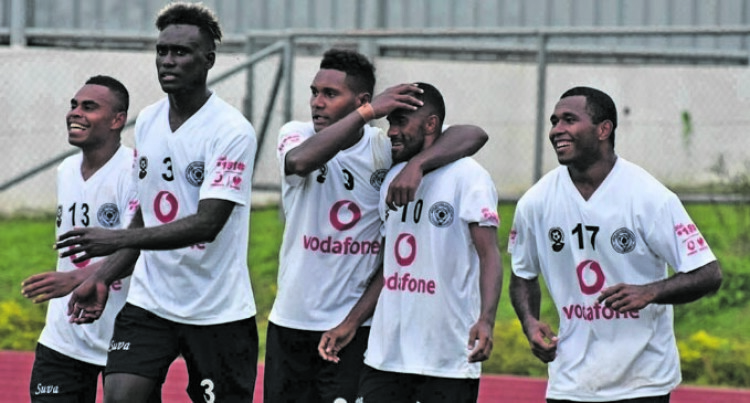 The sugar city team utilised their imports of Daniel Allen, Bong Kalo alongside Benjamin Totori but still could not find a way past a stubborn Suva defence. Comments: Lautoka coach Kamal Swamy said” “We performed badly and the players have to pull up their socks.